The Cistercian Abbey was probably founded in c.1210 by Risteárd 'Dubh' de Tuite, son of Richard Tuite an Anglo/Norman lord who built the Motte and Bailey settlement at Granard. The abbey was colonised with monks drawn from St Mary's Abbey in Dublin. Edward Bruce, brother of Robert Bruce plundered the abbey in 1315. Very little of the building survives today, just the central crossing tower with the adjoining parts of the north and south walls of the church and a winding staircase. 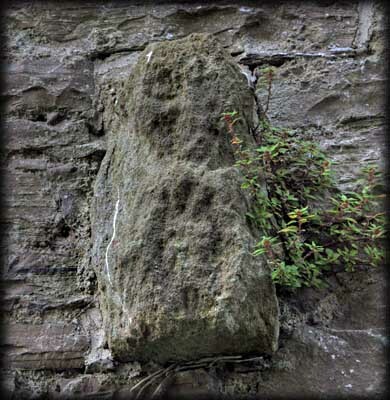 On the south wall of the crossing tower is a badly weathered 15th century Sheela-na-gig, pictured left. These are female exhibitionist figures displaying exaggerated vulvas. They are usually found on churches and castles in Ireland where about 100 examples exist. 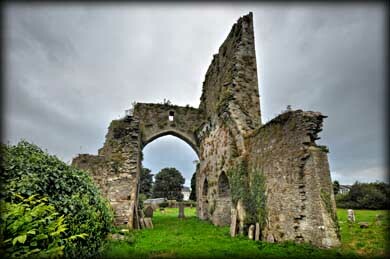 By the 15th century the abbey was held by the O'Farrell family. The last abbot was Richard O'Farrell who surrendered the monastery and its lands to Henry V111 who dissolved the abbey in 1540. Situated: From Granard head east on the N55. Turn right onto the R194. After 750 metres turn right onto the R396. At Abbeylara go straight through the crossroads. The abbey is through the gates on your left about 100 metres after the crossroads. Discovery Map 34: N 3649 7960. Last visit Sept 2012.